Best keep in a covered dish at the bottom of the fridge so that it can’t drip onto other foods. Don’t wash your turkey. This can spread harmful bacteria everywhere via splash. Any bacteria on the turkey will be killed with proper cooking, so no need to wash beforehand. It’s best to use a separate chopping board for raw meat. This board should be washed thoroughly in very hot water and dish soap and then left to air-dry. How many for dinner? Averaging it to about 1 and 1/2 pounds of turkey per person. (or 680 grams) Simply tally up how many guests there will be and add a few pounds on for bones. My family is having 8 for dinner, so we’ll be requiring a 12 – 14 pound turkey. Keep it crispy. By cooking the turkey on a layer of vegetables, you’re allowing hot air to circulate around the whole bird. This equates to a crispy deliciousness and the vegetables add great flavour and nutrition to the gravy. Cook stuffing separately. By cooking the stuffing on it’s own pan, you lower the risk for harmful bacteria to accumulate from the raw bird. Also, a stuffed turkey takes longer to cook which can result in the meat drying out. If you’re a keen turkey-stuffer, then you’re much better off using a few onions, herbs and maybe some garlic for an aromatic burst. Rub the turkey with butter or oil. This just makes all the difference. Before placing it in the oven, ensure the skin of the turkey is as dry as possible before massaging in some good ole grease. Some people even place pats of butter under the skin for moister meat, but personally I think it’s unnecessary. Almost ready to serve. 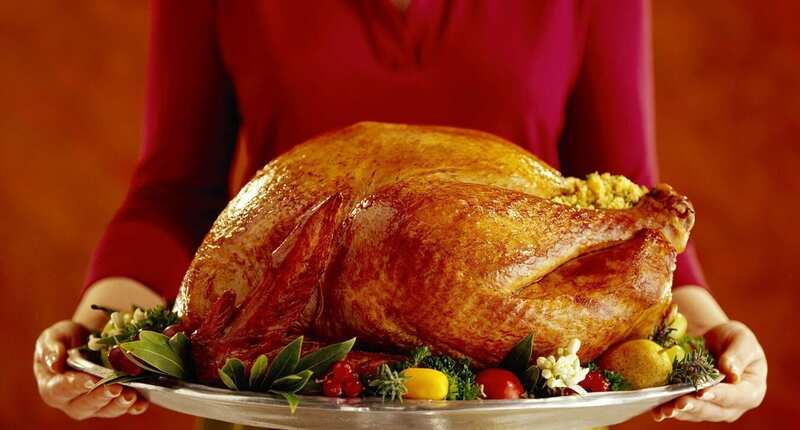 To lock in juices, tent your turkey with foil and let it rest for at least 15 to 20 minutes before carving. Be sure you don’t cover the turkey too tightly as you don’t want the bird to steam under the foil. Most importantly – don’t stress when cooking your turkey. Enjoy it! To ensure that the bird gets evenly cooked throughout, plan your cooking time in advance. The meat should be steaming hot all the way through and no pink coloration should be visible. Also, check that the juices run clear when you pierce the turkey. If you’re using a food thermometer, ensure that the thickest part of the bird (between the breast and the thigh) reaches at least 158ºF (70°C) for two minutes. Leftovers can be the best part! 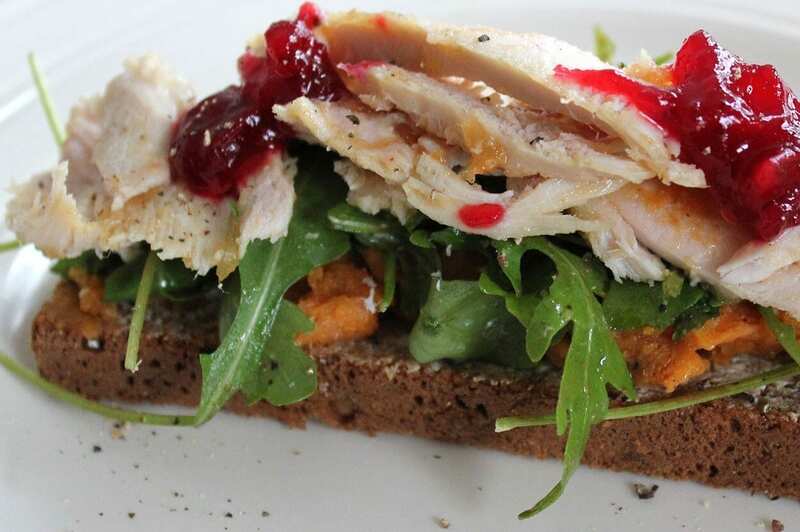 I love a turkey-sub slathered with cranberry sauce. Thankfully, I’ve never had any issues with leftover contamination, probably because I’m completely paranoid about getting food poisoning. My younger days living with my parents would be a regular game of 21 questions regarding any food I found in the fridge to make sure it was safe to consume. Yep, annoying as hell but hey! I’ve never been sick from bad food so jokes on you guys. Place into air-tight clean containers or cover them in cellophane (cling film) and refrigerate as soon as possible. If they are left out at room temperature, bacteria that causes food poisoning can grow and multiply. Your window of time for cooling your leftovers is between 1 – 2 hours. Ideally use leftovers within 48 hours. When using leftovers, only take as much as you need out without causing the rest of the unused food to fluctuate in temperature. If you are reheating the food, make sure it’s steaming hot all the way through and don’t reheat more than once. At The School of Natural Health Sciences we want you to have a safe, healthy and Happy Christmas! We’ve got lots more health-related blogs knocking around and release new ones every other day, so be sure to keep checking in for more insight! For a profound learning experience, check out our online selection of over 55 holistic therapy courses. With 18 years experience in training holistic practitioners, you will be in good hands! All our courses carry internationally recognised diplomas. We believe that the best learning occurs in a relaxed, convenient environment for the student. Distance-learning allows you to go at your own pace, fitting it around your own schedule, with the option of having a tutor if desired. It’s never too late to begin again or expand your horizons! See our latest course offers here.